Antique - Royal Stafford China Tea Set - "Blue Willow" Pattern - Made in England from 1890 thru 1930's - Totaling (28) Pieces, having a Service for (8) Eight. 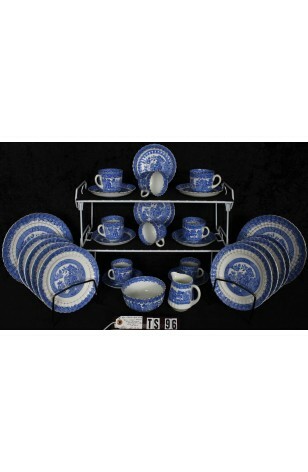 This Antique Royal Stafford China, having the "Blue Willow" Pattern, is a beautiful Blue and White Tea Set. The White Background is "Bright" and the Blue is a "Royal Blue", and very distinct. Blue Willow is an Oriental Pattern, made by numerous potteries. But this is a Fluted and Scalloped design, which sets it apart. All Plates have 22kt Gold Verges, and all Pieces have 22kt Gold Rims. Both Cups and Creamer also have 22kt Gold on their Handles. A full Service for (8) Eight, including two Cookie Platters. 8 - Bread, Dessert, Tea Plates - 7 1/8"